I may well be known most for photographing the skies at night, when they're full of stars and (hopefully!) aurora shows, still I can't resist my annual visit to the Airwaves air show in Portrush. I don't have the camera gear that allows me to get up close to the planes with a zoom that weighs the same as a baby elephant, but there is something about the atmosphere, the skills and (when the Typhoon or Lancasters arrive) the noise that fills the skies over Portmagic. So I offer below a selection of shots from 2017, a tribute to the incredible skills of the brave men and women who through themselves around the skies mercilessly for our thrill and excitement! The main shot I took this year was of the Typhoon. My 200mm zoom isn't really long enough to pick out the details of the bolts and rivets on the plane, so I decided to go for something a bit different - a composite shot of the plane banking around, its afterburners glowing a vivid orange against the pale blue of the sky. To capture this, I put my camera on high speed burst mode to catch the plane as it banked. Back at the computer, I loaded in all 17 separate shots into one Photoshop file and then began the painstaking job of manually aligning them into this arc. I used layer masks to paint in each of the photos of the Typhoon, resizing them a bit to increase the sense of perspective. Then I needed to nudge each of the planes subtly so that the arc was smooth. Finally, the background sky need quite a bit of work to smooth out the blotches (I did this through a combination of using Frequency Separation and Gausian Blur to remove the main parts, and by putting an overlay of a clear shot of the sky to smooth out the sky even more). It took me a few days to complete this, but I enjoyed doing it and am quite pleased with the outcome. I must admit that I'm a fan of shots that show the planes in context. This is, after all, the Portrush airshow, and if I can capture something of the landscape in the shots too, I'm happy. So here's the Typhoon with the unmistakable outline of Lacada Point at the Causeway in the background. 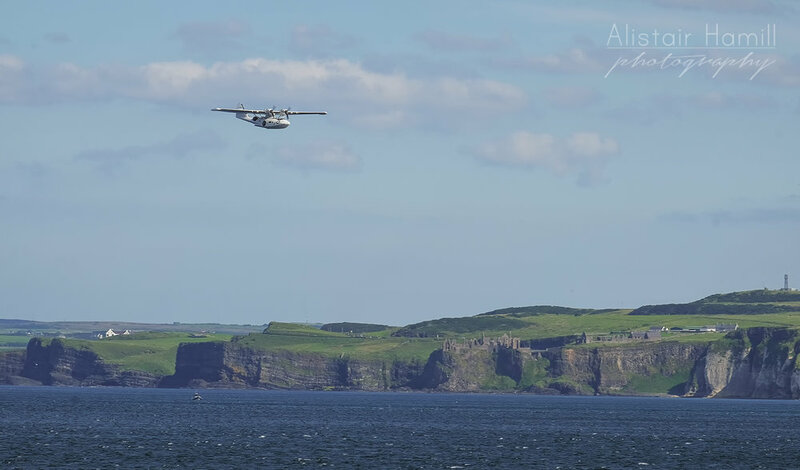 I managed to capture this amazing plane in context too, this time with Dunluce Castle along the cliff top behind it. Of course, no collection of air show shots would be complete without the iconic sights of the Red Arrows in tight formation, showing off the most incredible of piloting skills. And I couldn't resist a wee composite here too! This time, I used the program Starstax (which I normally use for star trails shots) to stack some photos of the burst out of the Red Arrows. As the planes are always so small in a wide angle lens, it's hard to do this kind of shot justice. But I quite liked the bit of fun this was putting it together. Thanks to my good buddy Chris Ibottson - fellow landscape photographer and Typhoon admirer - for the idea for the title for this blog!